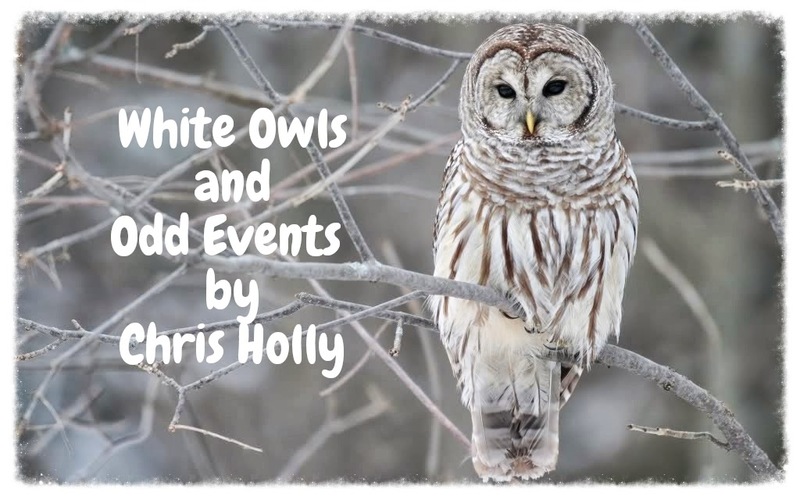 Experiencer, researcher and blogger Chris Holly writes about her lifetime of white owl sightings and how they relate to the paranormal and UFO lore. She is describing exactly what I’ve been seeing. Her insightful post linked HERE. 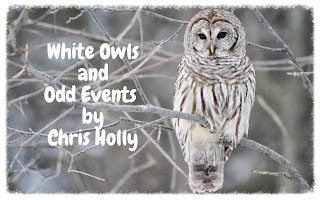 After reading the exchange at Chris' blog, I can't help wondering if we shouldn't see the owls in a more benign way than harbingers of "bad". I know that would be difficult for the person who wrote to her, but I think how we choose to perceive them shouldn't be fixed. Seems to me that leaving the question open allows for more freedom of experience. What would happen if this person, for instance, chose to perceive them as good, that they simply appear as benevolent messengers when hard times are around the corner, that one should be reminded of his power to overcome. Or that he is just in touch with his deep connection with those who will be affected. Gosh, I'd want to believe anything more than "bad." While I can empathize, I would make a different choice or feel comfortable leaving the question open. I'm sorry, but in my opinion, and for all I know, Chris Holly is a complete fake. I stopped reading the stuff she makes up months back. My favorite was that story where she, and a group of "scientists", would interact, through video chat (of all means), with an alien on the Internet, who suddenly and misteriously vanished. I also seem to recall that Lucretia Heart once reached out to her, and she didn't even bother to answer the e-mail (Lucretia, please correct me if I'm wrong). That totally clinched it for me, it goes completely against her on-line persona, she was probably worried it would expose her for the fake she is. I have spoken at length with Chris Holly on the phone. She certainly sees some things differently than I do, but that's not an issue for me. She actually got very emotional and sort of chewed me out for camping alone in the mountains (something I do a lot). The way she acted was quite stern, and in a way, her reaction sort of confirmed that something had quite probably happened to her. I have followed her for a while, and I don't share your opinion. Also, she and Randy Maugans (from Off-Planet Radio) have teamed up for some audio interviews. I trust Randy's intuition about this kind of stuff. The owls are concerned and should be ever since Harry Potter came along because, listen, India is currently weathering an endangered owl crisis, and Harry Potter is to blame. According to India's Environment and Forest Minister Jairam Ramesh, the country's population has become infatuated with owls as a result of the Harry Potter book series and films. In fact, many parents have bought wild owls from illegal bird traders to give the creatures to their children as pets. Sooooooo, word gets out, owls get upset and they show up all over the place looking for refuge. Nothing paranormal going on here. Chris Hollu is as fake as ectoplasms. Ectoplasms are cheesecloths dipped in eggs.